Way back in May (where DOES the time go) I spent a lovely hour chatting with Joy Licht, founder of Cayley Barrett, Assoc., a design-build firm in NYC about the lovely bathroom she did for this year’s Kips Bay Showhouse. Joy founded the company twenty years ago when there were nearly no women owned construction firms anywhere (still something of an anomaly, sadly). I really enjoyed speaking with Joy about her firm and their longtime association with the Kips Bay houses. 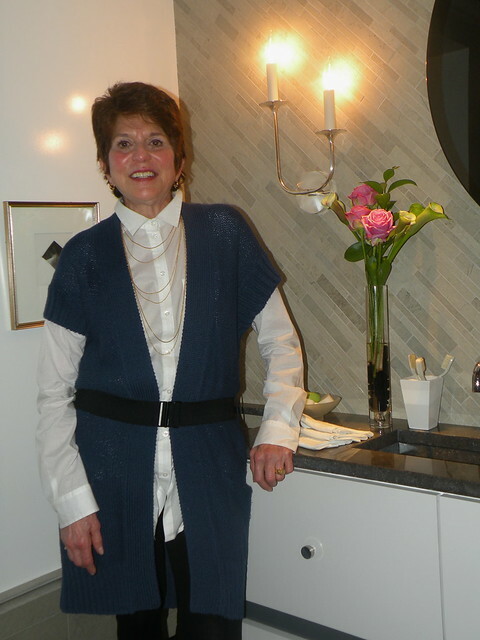 For several years, her firm did the construction work for other Kips Bay designers and for a long time she has done all the public restrooms in the various houses. Her firm started out primarily as a construction company but has expanded their offerings to include design services as well. We chatted a lot about the economy over the last several years and how it’s effected our industry. My takeaways from her many years of experience are: 1) Treat others as you wish to be treated. 2) Take the small jobs because you never know when they will lead to larger jobs, plus it allowed her to keep some of her staff on the payroll 3) If you think you can do something better than the next guy, then do it. 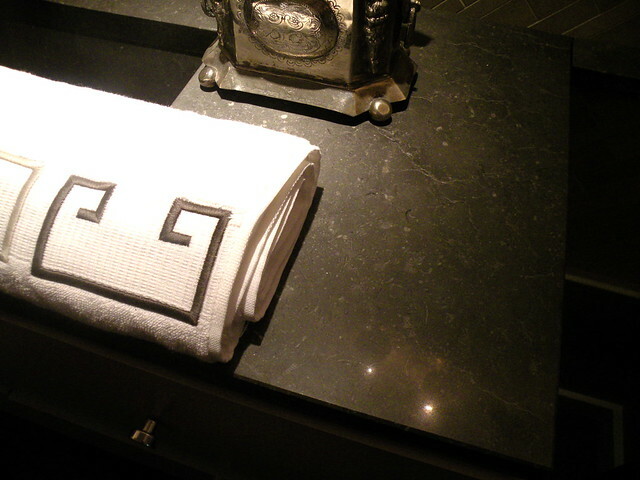 I thought the bathroom and dressing room were beautifully executed with lots of gorgeous details. The years Kips Bay house has current owners in residence (it’s not for sale or empty) so many details had to be retained, including the gorgeous old wood floors and floorplan. It’s not a large space, but Joy certainly packed in a lot of style. 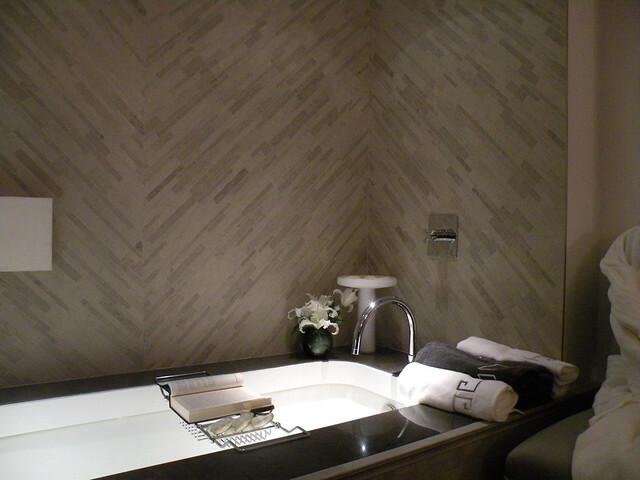 The waxed limestone tiles, from Artistic Tile, were laid in a Chevron pattern which really added visual interest and expansiveness to the otherwise small space. 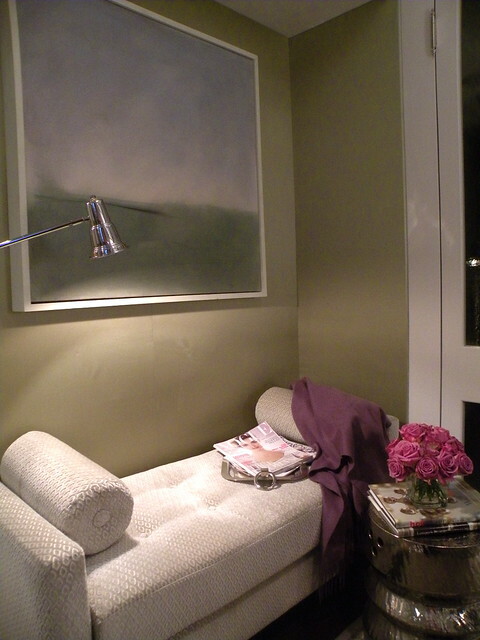 The soft gray palette, mixed with the original dark brown floors was an unusual yet lovely combination. 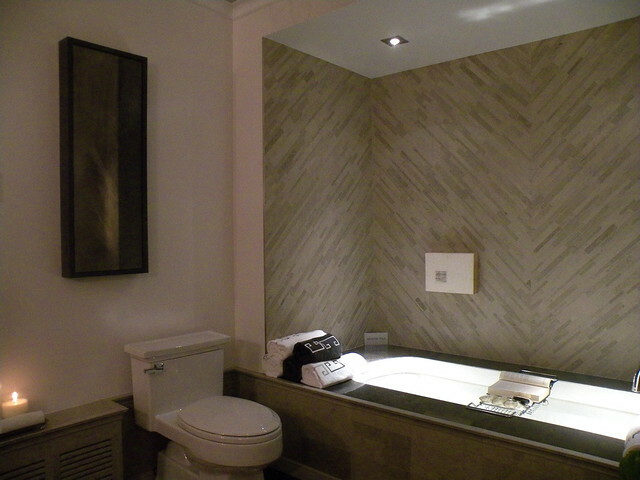 I love it when a bathroom is a show house actually looks like a bathroom, toilet and all! 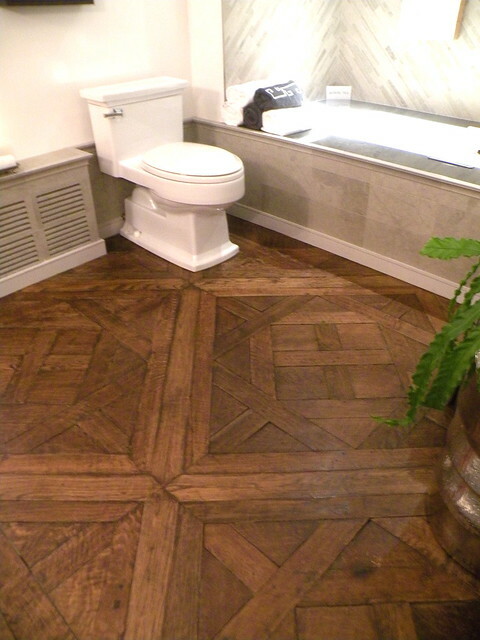 A detail of the gorgeous original parquet floors. 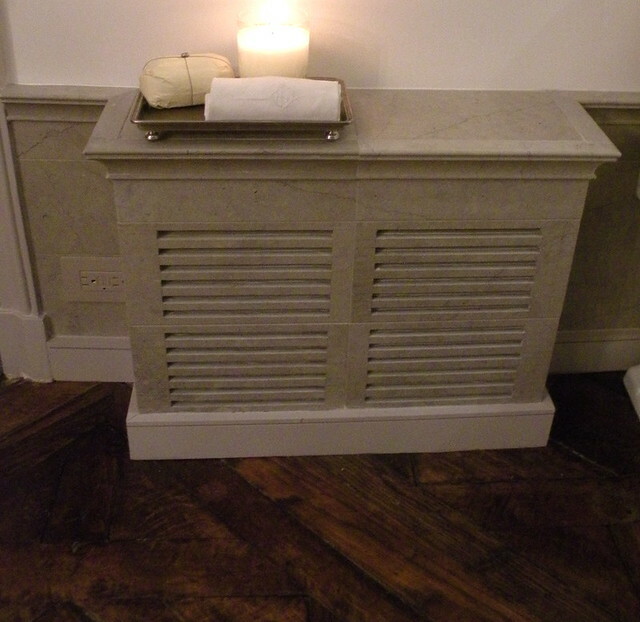 Joy built a tile surround for the heater which blended in with the wainscoting and provided a little extra surface space. Since the ceilings were not very high, Joy installed a lower than usual wainscot to give the impression of height in the walls. The counter and trough sink are Onondoga bluestone, which is in upstate NY. 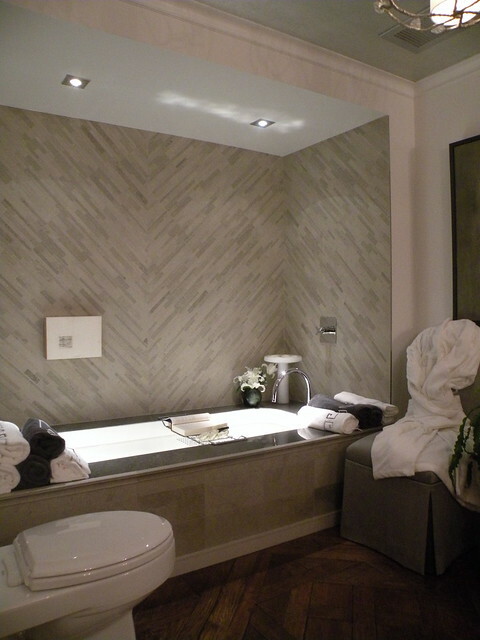 As mentioned, the bathroom is quite small and was a pass-thru from dressing room to the bedroom designed by Amanda Nisbet. The counter depth is quite narrow – approximately 15 inches – as any wider would have impeded the flow of traffic for attendees. She was hoping the homeowner would see that it was, in fact, fine for regular use and be interested in keeping it as is. It certainly helped keep the space feeling as open and spacious as possible and was as functional as one needs it to be. 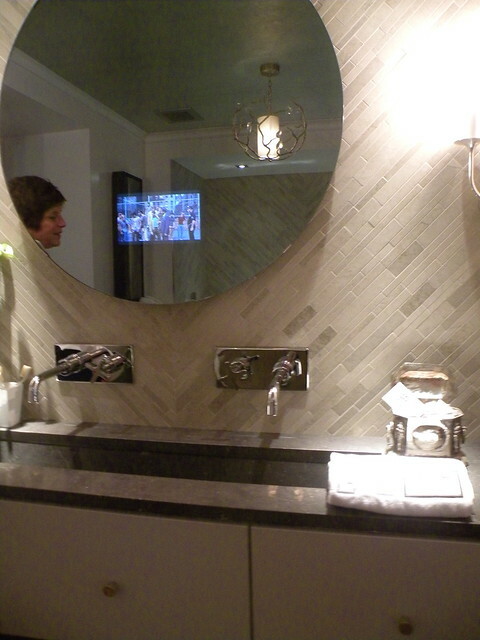 Loved the faucets installed on the wall and the round mirror, which soften the linear lines of the tile, stone and floor patterns. Onondoga Bluestone – it was slightly bluer in person. 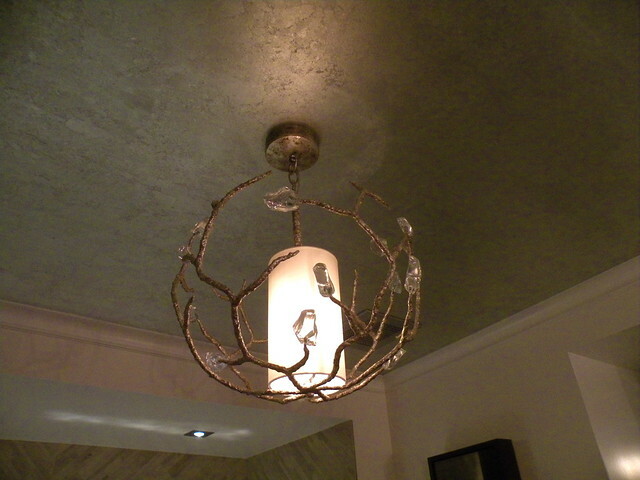 The ceiling fixtures in the bathroom and dressing room are the Blossom Chandelier from Porto Romano through Zoffany. 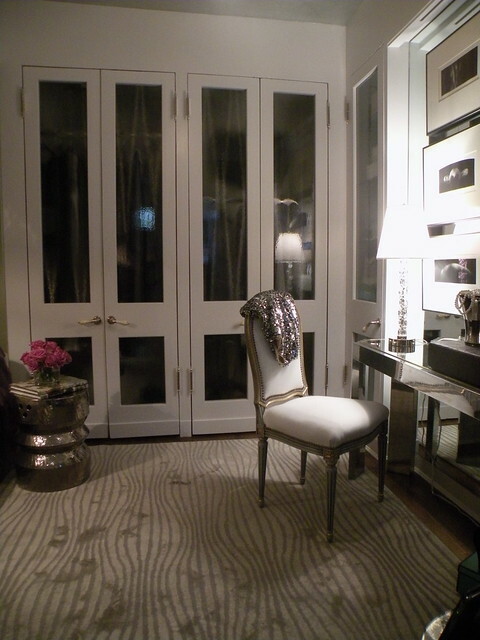 One thing Joy did throughout the space was mix the metals – polished chrome, silver, pewter, etc. She intentionally wanted to show that we don’t need to slavishly match all the metal finishes in a space to make it work. 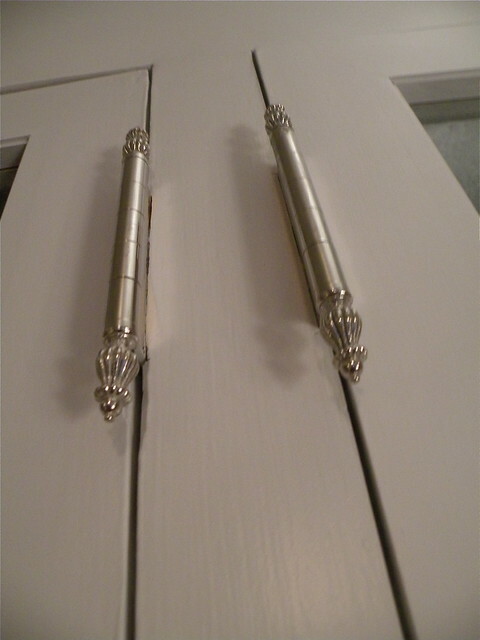 The glamorous dressing room includes closets outfitted with smoked “Chinchilla” glass inserts which obscure the contents nicely. 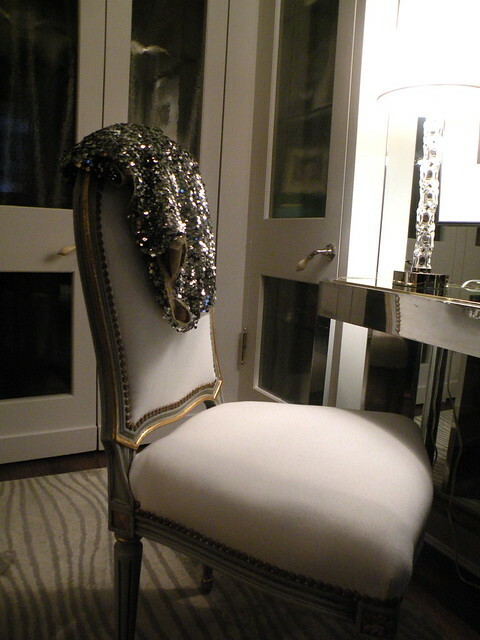 The dressing table was a study of mirrors, polished chrome and gilded woods. 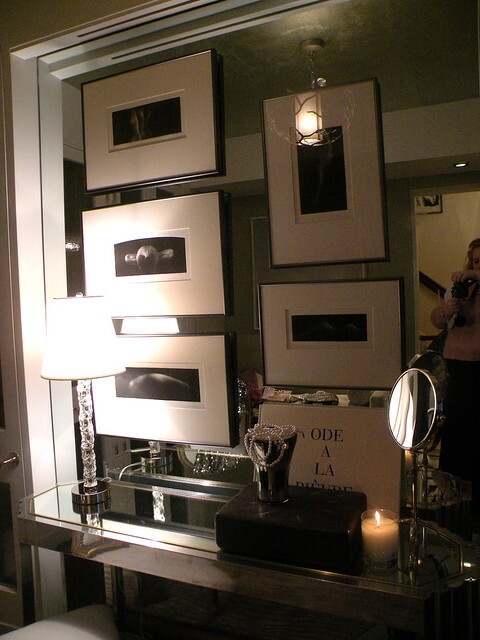 The artwork was mounted right on the mirrored wall, which may not be practical for every day use, but is a whimsical touch in a show house. Loved the touches of pink and lavender among the grays and silvers. 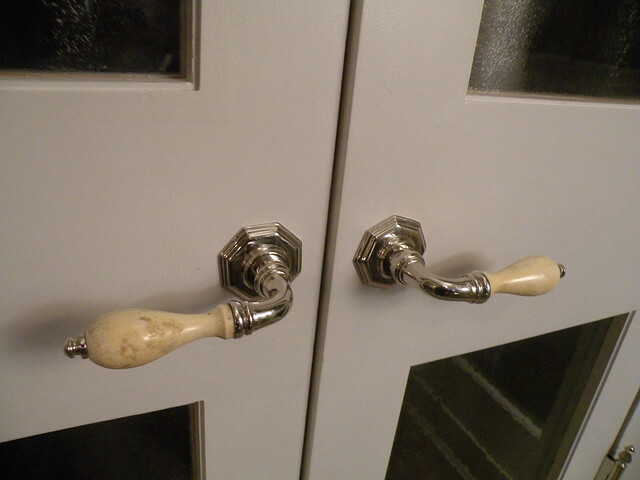 The handles and door hardware were original to the home and refinished in nickel. I want to thank Joy for spending so much time with me talking about her business and this bathroom as well. I apologize for the lateness of my post, but beautiful work is timeless! You can read my other Kips Bay post, which I managed to get out in June, here.